What Else Can I Expect From an Online Master's in Engineering Program? Engineering encompasses the development, construction, and implementation of structures, machines, tools, computer programs, and other innovations. Engineers rely on mathematics, technology, and scientific research to build and maintain their creations. A broad field with dozens of subdivisions, engineering at the collegiate level includes disciplines such as electrical engineering, mechanical engineering, civil engineering, software engineering, and aerospace engineering. Students generally choose from two types of degrees: a research-driven master of science in engineering, or a professional master of engineering. According to the Bureau of Labor Statistics (BLS), most entry-level engineering jobs are attainable with an associate or bachelor's degree. An online master's degree in engineering will help graduates land a job and advance in their careers more quickly than their bachelor's-holding counterparts. An engineering master's will also qualify job-seekers for managerial titles reserved for candidates with a graduate degree. Master's students who wish to boost their career standing further may choose to earn a degree specialization in their desired engineering field. AN ONLINE MASTER'S IN ENGINEERING PROVES IDEAL FOR STUDENTS WHO WANT TO SPECIALIZE IN A SUBFIELD OF A PARTICULAR BRANCH OF ENGINEERING OR JUMP INTO MANAGEMENT. Learn more about what you can do with an online master's in engineering and the career opportunities in your future with this comprehensive guide. WILL AN ONLINE MASTER'S IN ENGINEERING PROGRAM PROVIDE ME WITH THE SKILLS I NEED TO ADVANCE MY ENGINEERING CAREER? Master's-level engineering programs are designed to build on the foundational knowledge you have gained as an undergraduate and introduce more complex concepts. Students will enroll in course sequences dedicated to their areas of specialization, as well as related areas of engineering. Additionally, many programs require students to complete a master's research thesis or an independent study project. Engineering master's programs typically do not require an internship, but students may be able to find on-site training opportunities through their school's career center. WILL AN ONLINE MASTER'S IN ENGINEERING WORK WITH MY SCHEDULE? Online engineering master's degree programs offer a flexible alternative to classroom-based learning. Students are able to access course materials, submit written assignments, take exams and communicate with their professors any time of day from the comfort of their home computer. Additionally, they can study on the go using a laptop, tablet, smartphone or other device with Wi-Fi capabilities. Course faculty will also offer consultations for students who are composing a master's thesis or participating in an independent study. Online engineering master's degree programs offer a flexible alternative to classroom-based learning. Students can access course materials, submit written assignments, take exams, and communicate with their professors any time of day from the comfort of their home computer. Additionally, they can study on the go using a laptop, tablet, or smartphone. Course faculty will also offer consultations for students composing a master's thesis or participating in an independent study. WHAT JOBS CAN I GET WITH MY MASTER'S IN ENGINEERING? Students who graduate with a master's degree in engineering will enter the workforce qualified for most entry-level jobs in their specific field, in addition to some top-level roles. The best online master's in engineering programs prepare students for additional career steps, such as the required state license for certain managerial positions in mechanical, civil and aerospace engineering. WHAT ARE THE BEST ONLINE MASTER'S IN ENGINEERING PROGRAMS? Only you can properly evaluate whether a target school's strengths match your educational needs. The following ranked list of schools should serve as a helpful starting point in your search for the best online engineering master's programs in the United States. If you are considering an online engineering master's degree, be sure to contact admissions specialists at different colleges and universities to learn more their about specific requirements and offerings. Located in Gainesville, the University of Florida offers several graduate online engineering degrees through the UF EDGE program. Available engineering majors include materials science, industrial and systems, and mechanical and aerospace engineering. Each degree offers a master of science and/or master of engineering option with a curriculum that students complete fully online or in a hybrid format. The 30-credit MS in materials science and engineering offers four tracks: metals, polymers, electronic materials, and structural materials. All students complete a common core regardless of the track. The core covers five topics, including materials thermodynamics and advanced materials principles. Students complete required and optional electives for each track. All students must complete six research credits in addition to the core. Students can transfer up to nine credits into the online engineering master's degree. Students interested in a curriculum that emphasizes data analysis, modeling methods, and design practice opt for the 31-credit master of science or engineering in industrial and systems engineering. The curriculum includes courses in manufacturing management, systems management, advanced engineering economy, and linear programming and network optimization. Engineering students can participate in virtual career fairs and skill enhancement programs at one of the nation's top-ranked career centers. Admission requirements vary by program but include a strong background in science or engineering and GRE scores. The nation's first research college, Johns Hopkins University can claim association with 27 Nobel laureates. The college's nine academic divisions include the school of engineering, which offers several graduate degrees online for working professionals. Part-time options include an MS in applied biomedical engineering, an MS in engineering in civil engineering, and an MS in information systems engineering. In the fully online or hybrid MS in applied biomedical engineering, students choose from specializations such as imaging or translational tissue engineering. All students complete core coursework in physiology for applied biomedical engineering and mathematical methods for engineers. Another required course, biomedical engineering practice and innovation, blends online courses with six days of intensive design and clinical work on the main campus in Baltimore. The master of civil engineering offers both fully online and hybrid curricula, each with a track in structural engineering. The 10-course curriculum requires three core courses: mathematical methods for engineers, geotechnical engineering principles, and structural mechanics. Students on the structural engineering track need a professional structural engineering background. Students pursuing an online engineering master's degree pay the same per-course tuition regardless of residency. Applicants need a bachelor's or master's degree in a technical field and a minimum 3.0 GPA. The school also recommends submitting GRE scores. Renowned for academic excellence, Harvard University enrolls 20,000 students on campuses in Cambridge and Boston and online. Harvard boasts notable graduates, including 48 Nobel laureates and 32 heads of state. The school's graduate programs include a 12-course master of liberal arts in software engineering that students complete mostly online. The program prepares software engineers to design software solutions and adapt to emerging technologies. Students must pass two prerequisite courses before full enrollment: theoretical foundations and systems programming. Both courses count toward the degree's 12-course requirement. Learners in the online engineering master's program complete 10 additional courses covering topics such as data communications, cloud computing, and software design. Students can use electives to pursue a certificate in cybersecurity, data science, or web technologies. Learners culminate the degree with a thesis documenting their software engineering research or a collaborative capstone project. Students can complete most courses online, but most complete one course on campus. They fulfill this requirement through a three-week January session or a three- or seven-week summer session. Students pay the same tuition regardless of residency. Admission requires programming experience with C++ or Java and completion of the two prerequisite courses with a minimum 3.0 GPA. Georgia Institute of Technology focuses exclusively on science and technology. The school delivers a comprehensive portfolio of degrees on a 400-acre campus in the center of Atlanta and online. U.S. News & World Report ranks all of Georgia Tech's graduate engineering programs in the top 10. The school offers a suite of online graduate engineering degrees. Students choose from majors such as aerospace, electrical and computer, and mechanical engineering. The 33-credit MS in aerospace engineering trains engineers to design, build, and improve commercial and military aircraft systems. The curriculum includes core courses in orbital mechanics, aerospace systems engineering, advanced design methods, and computational fluid dynamics. The program allows learners to tailor the degree to their goals with concentrations such as flight mechanics and control and propulsion and combustion. The 30-credit MS in mechanical engineering focuses on core topics such as optimization in engineering design, modeling and simulation in design, and automated manufacturing process planning. The program offers several concentrations, including bioengineering and automation and mechatronics. Students in the hybrid professional 30-credit master's in applied systems engineering learn from top engineers and researchers while working full time. Core courses include modern systems engineering, lifecycle and integration, and systems of systems and architectures. All three online engineering master's degrees require that students hold a relevant engineering degree and submit GRE or GMAT scores. Columbia University, an Ivy League college, sustains a legacy of distinguished programming in the heart of New York City. The school's student body continues to increase with more than 33,000 students enrolled. The school offers fully online engineering degrees with three majors: biomedical engineering, chemical engineering, and civil engineering. All three majors require 30 credits that lead to a master of science. The MS in biomedical engineering prepares engineers to apply engineering and applied science principles to fields such as biology and medicine. Students complete core courses in quantitative physiology, solid biomechanics, and computational modeling of physiological systems. They also complete one math course and six electives. The MS in chemical engineering cultivates engineers with expertise in materials and their production. The core examines four subjects, including transport phenomena and mathematical methods in chemical engineering. The degree offers 18 electives, some of which students may use to complete master's research. The MS in civil engineering offers one of the more flexible engineering degree plans at Columbia, with multiple concentration options in subjects such as construction engineering, hydrogeology, and continuum mechanics. Students complete core courses in subjects such as finite element analysis, theory of vibrations, and elastic and plastic analysis of structures. Students in the online engineering master's programs pay the same tuition regardless of residency. Applicants need a minimum 3.0 GPA and must submit GRE scores. The University of Southern California is a leading private college located in Los Angeles. USC enrolls 47,000 students on campus and online. USC Online offers MS in engineering degrees with majors such as aerospace, astronautical, petroleum, and biomedical engineering. The 27-unit MS in astronautical engineering focuses on science and space technology, preparing space engineers to design rockets and space launchers, space navigational systems, manned space vehicles, and other systems. Students from diverse engineering backgrounds enroll in the blended program, studying subjects such as space propulsion, orbital mechanics, and spacecraft thermal control. They use core and technical electives to focus on a concentration, such as space systems design. The 27-unit MS in petroleum engineering is one of the oldest programs of its kind in the nation. The program boasts small classes, renowned instructors, and close proximity to California's oil fields. Students learn how to explore, discover, and produce oil and gas through a curriculum that covers topics such as petroleum reservoir engineering, petroleum geochemistry, and formation damage in petroleum reservoirs. The 28-unit MS in chemical engineering trains engineers to work in any industry, including chemical, energy, and pharmaceutical manufacturing. Students complete advanced courses in subjects such as transport phenomena, thermodynamics, and kinetics and reaction engineering. They can pursue specializations with electives. 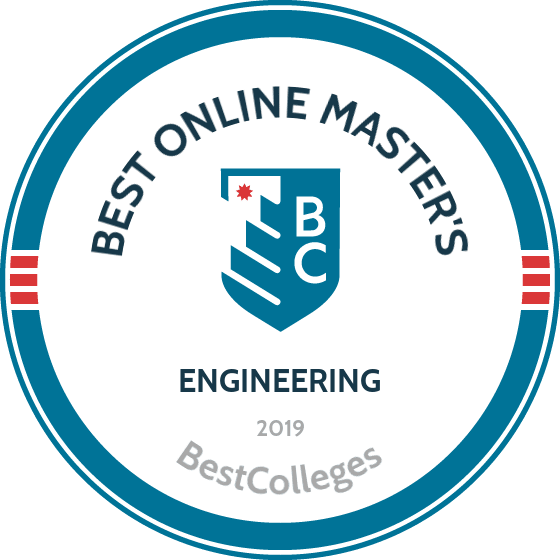 Applicants to the online engineering master's need a bachelor's degree in engineering, a competitive GPA, and GRE scores. North Carolina State University at Raleigh is a leader in science, technology, engineering, and math education. NC State enrolls 34,000 students on campus and online. Through Engineering Online, students complete one of 16 engineering degrees and certificates in majors such as aerospace, civil, and environmental engineering. The fully online programs offer part-time enrollment to accommodate working engineers. The 30-credit MS in aerospace engineering enrolls learners seeking a fully online accelerated format. The year-long curriculum covers topics such as advanced engineering thermodynamics, engineering design optimization, fluid dynamics of combustion, and heat transfer theory and applications. In the 30-credit MS in civil engineering, students complete core courses in addition to coursework in concentrations, such as construction engineering, geotechnical/geoenvironmental engineering, or transportation systems. The 30-credit MS in environmental engineering prepares engineers to address pressing environmental issues, such as air pollution and solid waste management. The curriculum covers topics such as air quality engineering, water resources engineering, and environmental exposure and risk analysis. NC State offers financial aid and payment plans to help students afford the online engineering master's degree. All degrees require an engineering degree, a minimum 3.0 GPA, prerequisite courses in some cases, and GRE scores. GRE waivers are available in some instances. Founded by Thomas Jefferson in 1819, the University of Virginia offers programs administered through 11 schools. The school provides working engineers with flexible online degrees that they complete at their own pace through Virginia Engineering Online. Thanks to the virtual college's participation in a consortium, engineers can complete up to half of UVA's engineering degree requirements at partnering institutions, such as Virginia Tech, George Mason University, and Old Dominion University. Virginia Engineering Online offers online master of engineering degrees in majors such as chemical, civil, and systems engineering. All students work with advisers to develop a plan of study. With the exception of systems engineering, all degrees require 30 credits. The master of engineering in chemical engineering requires core coursework in advanced thermodynamics, mass transfer, chemical reaction engineering, and transport processes. Students tailor their degree with electives in areas such as polymer engineering and bioseparations engineering. The master of materials science and engineering requires four core courses, including electronic and crystal structure of materials and thermodynamics and phase equilibria in materials. Students complete electives in subjects such as transmission electron microscopy, the physics of materials, and deformation and fracture of materials. Students can complete courses unavailable at Virginia Engineering Online at one of the partnering institutions. Admission to any of the online engineering master's degrees requires an engineering bachelor's degree, a minimum cumulative 3.0 GPA, and GRE scores. Some students may apply for a GRE waiver. One of the nation's top public colleges, the University of Washington enrolls 54,000 students on campuses in Seattle, Tacoma, and Bothell. UW Online offers online master's degrees in civil engineering, aerospace engineering, and mechanical engineering. The 42-credit MS in civil engineering offers tracks in construction engineering and energy infrastructure. Students complete the degree online on a part-time basis in 2-3 years. They choose one of two options: a professional master's program for learners planning career advancement or the research-intensive academic track for students planning to pursue a doctorate. The 45-credit master of aerospace engineering provides a curriculum that students complete on campus or online in three years on a part-time basis. Students choose one of four concentrations: controls, fluids, structures, or composites. All students complete a course in analytical methods for aerospace engineering and a five-course core pertinent to their concentration. Students complete the 42-credit MS in mechanical engineering (MSME) online in 3-4 years of part-time study or two years of full-time study. Learners enter the program with undergraduate mechanical engineering preparation in subjects such as thermodynamics, mechanics of materials, and machine learning. The MSME includes coursework in mechanical engineering analysis, computational fluid dynamics, and computational techniques in mechanical engineering. Admission to any of the online engineering master's programs requires an engineering degree, prerequisite courses where applicable, and a minimum 3.0 GPA. The University of Michigan-Ann Arbor offers 263 programs through 19 schools and colleges. The school hosts 102 graduate programs ranked in U.S. News & World Report's top 10. It also ranks second for research and development expenditure for public colleges, according to the National Science Foundation. Faculty foster personalized learning and student success with a 15-to-1 student-to-faculty ratio. The school's engineering college offers five fully online master of engineering degrees, including automotive, energy systems, and manufacturing engineering. Full-time students complete the 30-credit master of engineering in automotive engineering in 1-2 years. The curriculum includes core courses on internal combustion engines, auto body structures, and power electronics. Students take electives on topics such as hybrid electric vehicles and modeling and analysis of vehicle systems. The 30-credit master of engineering in manufacturing offers concentrations in five areas, including production systems and quality engineering, manufacturing design and sustainability, and advanced materials and manufacturing. Core courses vary by concentration. Students build a degree with electives and business management and operations courses covering subjects such as entrepreneurship, accounting and finance, and business and data analytics.All engineering students engage in action-based learning, research projects, and industry practicums. They benefit from access to a diverse network of faculty and subject matter experts from academia and industry organizations. Admission to the online engineering master's degrees requires transcripts and GRE scores. Carnegie Mellon University oversees more than 100 research centers and institutes. U.S. News & World Report ranks several of the school's graduate engineering programs in the top 10. One of those programs, the master of software engineering (MSE), offers a fully online curriculum. The MSE, which offers learners full- or part-time curricula, emphasizes software architecture and project management. The experiential learning curriculum requires student collaboration on team-based projects with clients such as Google, General Motors, and IBM. Students learn from faculty with substantial technical experience. The degree plan covers topics such as models of software systems, managing software development, analysis of software artifacts, and architecture for software systems. Students use independent study to pursue an area of interest that complements the degree's core. Though students usually complete this option independently, they may also work in small teams. The MSE studio provides learners with a lab where they can apply the lessons they've learned. Students use the studio to project scope, develop designs, and manage teams. Applicants to this online engineering master's degree need at least two years of software development experience. Admission also requires GRE scores, programming skills in Java, C++, Pascal, or a similar language, and undergraduate courses in math, algorithms, and data structures. An Ivy League college, Cornell University enrolls 23,000 students in programs administered by 15 schools and colleges. Learners study on a main campus in Ithaca, at several satellite campuses, and online. Cornell's 50 Nobel laureates and other recipients of accolades underscore the school's academic pedigree. The master of engineering in systems engineering convenes an elite cohort of engineers who work at some of the world's top companies, such as Boeing, BAE Systems, and Lockheed Martin. Students complete the 30-credit curriculum on a part-time basis. The curriculum covers topics such as model-based systems engineering, principles of project leadership, and systems analysis behavior and optimization. A one-week intensive course — systems engineering management for virtual teams — requires that engineers spend 35 hours working in teams to complete a design challenge. A second one-week intensive requires learners to spend 35 hours focusing on creativity and innovation as they cultivate systems engineering leadership skills. Students apply systems engineering knowledge and skills during two-semester projects conducted in classes with a small student-to-faculty ratio. Past projects include the development and launch of an autonomous in-orbit satellite system and the creation of new National Science Foundation videogames. Students use proctors to complete the required exams for the online engineering master's degree. Admission requires GRE scores, a bachelor's degree in engineering, mathematics, or science, and at least one year of relevant work experience. The program admits students in the fall and spring. Founded in 1865, Lehigh's main campus is in Bethlehem, with additional locations in Mountaintop and Goodman, Pennsylvania. The university serves more than 7,000 students and offers nearly 200 undergraduate and graduate programs. Since 1992, many of these programs have been available through the school's Office of Distance Education. Engineering students may choose from seven online engineering master's programs: biological chemical engineering, chemical energy engineering, chemical engineering, healthcare systems engineering, management science and engineering, mechanical engineering, and polymer science and engineering. Majors in engineering require 30-31 credits and may involve a culminating capstone course or research project. While application requirements vary, applicants should hold a bachelor's degree in a field related to their desired major. Some programs, such as the master's in management science and engineering, require students to submit GRE scores and include a minimum GPA for admission. Lehigh charges the same per-credit tuition for courses delivered on campus and online but adds an access fee for online study. Students complete distance courses asynchronously at Lehigh through the Course Site learning management system. Lehigh employs two modes of delivery for off-campus courses: classroom live and classroom online, offering streaming feed of on-the-ground instruction for distance learners. Online students can access collaborative support tools, watch virtual information sessions, and pursue tech support online. Established in 1848, the University of Wisconsin-Madison encompasses a 936-acre main campus and an online division offering engineering professional development programs. UW-Madison serves more than 44,000 students and offers hundreds of undergraduate and graduate majors. U.S. News & World Report recently ranked UW-Madison among the top 10 in the nation, for the fifth consecutive year, for its online graduate engineering programs. Students can choose from seven online engineering master's degrees: engine systems, engineering data analytics, engineering management, manufacturing systems engineering, mechanical engineering, polymer science, sustainable systems engineering, and electrical engineering. All programs require 30 credits in core and elective courses, with some including optional independent study projects. Students can complete most of the online graduate engineering programs in 2-3 years. Applicants must hold a bachelor's degree from a regionally accredited institution, with a minimum 3.0 GPA. Most programs require that an applicant's bachelor's degree be in a related engineering discipline, and some require that the bachelor's program holds accreditation through the Accreditation Board for Engineering and Technology. While not required, admissions advisers strongly recommend that students submit GRE scores for consideration. Students complete the majority of the engineering graduate degrees online. Several programs, however, including the engineering management, engine systems, and electrical engineering programs, may require a summer residency or lab on campus. UW-Madison charges per-credit tuition rates based on a student's status of residency in the state of Wisconsin. Students can access coursework and distance learning resources through the eCampus platform. Founded in 1867 as a land-grant research institution, the University of Illinois system encompasses campuses in Chicago, Springfield, and online, in addition to its main Urbana-Champaign location. Home to the tenth-best program in the nation according to U.S. News & World Report, the university offers multiple online engineering master's degrees through its world-renowned College of Engineering. The college offers the following online engineering master's degrees: an MS in aerospace engineering, a master of engineering in bioinstrumentation, an MS in civil and environmental engineering, a master of computer science, a master of engineering in mechanical engineering, and an MS in mechanical engineering. Most programs require completion of 32 credits, with many offering multiple specializations within each field. Online graduate engineering programs typically follow a non-thesis curriculum and culminate in an online seminar or capstone requirement. Students complete online courses through Blackboard, supported by additional distance learning platforms including Echo360, Skype, and Adobe Connect. The College of Engineering offers test proctoring, student advising, and tech support options for distance learners. Students also enjoy program-specific tools, including access to the world's largest engineering library and numerous engineering research center databases. Online students at UI's College of Engineering all pay the same per-credit rate for online graduate tuition regardless of state residency. Distance courses follow the same semester-based schedule as on-campus coursework. Students may begin the program at multiple start dates throughout the year. Among the many points of pride for this nationally renowned university, UCLA's graduate education division boasts association with recipients of Nobel and Pulitzer prizes, Fulbright scholars, and Guggenheim fellows. UCLA offers more than 120 graduate programs through many academic schools, divisions, and institutes. U.S. News & World Report ranks UCLA as tied for second in the nation for its online graduate engineering programs. Students can complete an online engineering master's degree at UCLA in one of 11 majors and concentrations including aerospace, electrical, and manufacturing and design. The MS in engineering, in any specialization, includes a core curriculum in upper- and lower-division and graduate coursework, typically culminating in a student research project or capstone course. Some programs require development of a thesis to conclude the degree. In most cases, online programs do not include campus residency requirements. Applicants must possess a bachelor's degree in an engineering discipline related to their desired program with a minimum 3.0 GPA for the final two years of undergraduate coursework. Though required, students may qualify to waive the submission of their GRE scores if they meet other academic qualifications. Additionally, applicants must submit three letters of recommendation and a statement of purpose. UCLA students complete courses online through Blackboard, supplemented by a mobile Blackboard app. Distance learners may access the same academic and personal resources as on-campus students, including career counseling, psychology, and veterans services. The online engineering master's degree follows the same schedule as the on-campus program. Founded in 1898 in Boston, Massachusetts, Northeastern University offers more than 80 undergraduate and graduate programs in over nine colleges and schools. The university operates multiple graduate campuses across Boston as well as in Charlotte, North Carolina; Seattle, Washington; San Jose, California; and Toronto, Canada. The school also offers more than 60 degrees and programs through Northeastern Online. Northeastern's College of Engineering features an MS in engineering management. The online program requires that students complete a combination of general education courses and electives. Topics include organizational psychology, fundamentals of energy systems integration, statistical engineering methods, and quality control. Students may also opt to complete an experiential learning component through the College of Engineering Graduate Cooperative Education Program. Students may enroll in full- or part-time study to complete the degree. Most students complete the online engineering master's in 18-24 months. Applicants must submit all undergraduate transcripts and official GRE scores for consideration. Additionally, application to the MS in engineering management at Northeastern requires two letters of recommendation, a statement of purpose, and a resume. Distance learners complete courses online through Blackboard. Students pay the same rate per credit for graduate engineering courses online, regardless of their state of residence. Northeastern delivers courses online through an exclusive video-streaming technology. Through this method, students can view lectures taped in classrooms on campus at Northeastern, then download the lectures for repeat views in the learning management system. Established in 1854 as Brooklyn Collegiate and Polytechnic Institute, the Tandon School of Engineering officially merged with New York University (NYU) in 2014. Today, NYU Tandon offers more than 50 undergraduate and graduate programs across 10 academic schools, including six online master's degrees. U.S. News & World Report ranked NYU Tandon 13th in the nation for its online graduate engineering programs. Students can complete an MS in industrial engineering online at NYU Tandon. The online engineering master's program involves required program electives and general elective courses totaling 30 credits. Core coursework explores topics including system simulation, project planning, and quality management and control. The NYU Tandon program features a unique mentorship support program and offers access to career services through the university's Wasserman Career Center and NYU CareerNet. Applicants must hold a bachelor's degree from an accredited institution. A student who completed an ABET-accredited program and/or holds a bachelor's degree in engineering may receive preference for admission into NYU Tandon. Additionally, students must satisfy prerequisites in courses including probability and statistics. Only full-time applicants must submit GRE scores. Distance learners complete courses in NYU Tandon Online through the NYUAlbert platform. Students can access resources including an online tutor-matching service, virtual student orientation, and online test-proctoring options. Students may enroll in distance courses in the fall, spring, or summer semester. With a main campus in Tampa Bay, the University of South Florida (USF) operates additional locations in St. Petersburg and Sarasota-Manatee. The university serves an enrollment of more than 50,000 students, offering more than 230 academic programs on campus and online. USF Tampa boasts Carnegie classification as both a doctoral research and community-engaged institution of the highest order. USF offers an MS in engineering management through its Industrial and Management Systems Engineering Department. The interdisciplinary online engineering master's encompasses general, quantitative, and workforce management core and elective courses. Topics include the principles of engineering management, operations research for engineering managers, and statistical design models. Students must complete a capstone in engineering management policy and strategies to conclude the degree. Applicants must hold a bachelor's degree in engineering from a regionally accredited institution with a minimum 3.0 GPA for the last two years of undergraduate work. Additionally, students must submit GRE scores and a resume or letter of recommendation. The program requires applicants to complete either two years of professional engineering or management experience or an internship during the course of the degree. Students complete courses online in Canvas. USF offers a variety of support resources through its IT service desk, including live online tech support, counseling options, and streaming technology through the USF Netcast platform. Distance learners can apply to the USF graduate program in the fall, spring, or summer semester. Established in 1871 in College Station, the Texas A&M system also includes branch campuses in Galveston and in Doha, Qatar. More than 69,000 students enroll at Texas A&M, choosing from hundreds of academic programs available through 19 schools and colleges. U.S. News & World Report recently ranked Texas A&M as No. 1 in Texas and No. 7 in the nation for its online engineering graduate program. Texas A&M offers an online master's in engineering in eight disciplines: computer engineering, electrical engineering, engineering systems management, engineering technical management, mechanical engineering, petroleum engineering, safety engineering, and subsea engineering. The university also offers a cybersecurity specialization within its new master of engineering degree and an engineering-specific industrial distribution program. Each of these master's degrees encompass a straightforward curriculum of core engineering courses offered exclusively online. While admission requirements vary, applicants should possess a bachelor's degree from an accredited institution in their desired concentration of engineering or a closely related field. Additionally, students must submit GRE scores, a personal statement, and three letters of recommendation. Distance learners may apply to the online master's in engineering during the fall or spring term. While some master of engineering degrees may require minimal campus visits and/or field coursework, students can complete the MS in computer or electrical engineering completely online. Distance learners complete courses online through the eCampus learning management system. WPI serves more than 6,000 students and ranks among the nation's best STEM colleges, according to Forbes. The university also operates more than 50 international campus locations in support of its Global Projects Program. WPI offers more than 50 undergraduate and graduate degrees across 14 academic departments, including multiple online engineering master's degrees. WPI offers the following engineering disciplines online: electrical and computer, environmental, fire protection, mechanical, mechanical engineering for technical leaders, power systems, robotics, and systems engineering. Most programs require students to complete 30 credits in core coursework in their respective engineering major. While some programs require a final project or capstone to conclude the degree, WPI generally does not offer thesis options for online programs. Though admissions requirements vary, applicants generally require a bachelor's degree in their respective engineering major or a related field of study. Additionally, students must satisfy prerequisites in core engineering concepts such as physics, math, engineering, and potentially computer science. In any engineering major, students may choose from immersive electives in their chosen area of concentration. Courses in WPI's online master's in engineering programs span the fall, spring, and summer terms. Students complete most courses asynchronously through the Canvas platform. Distance learners enrolled in part-time study online can complete the MS degree in 3-5 years. Online students may attend the commencement ceremony at the WPI campus. Established in 1850 in Salt Lake City, the University of Utah serves a student enrollment of nearly 33,000. The university claims a position as Utah's oldest and most recognized higher education institution and ranks among the best in the nation for its value and engineering programs, according to U.S. News & World Report. The Department of Electrical and Computer Engineering, along with the Center for Engineering Innovation, offers an online MS in electrical and computer engineering (MSECE). The ambitious online master of engineering prepares students to direct the future of technology interfacing and quantum computing. The 30-credit MSECE encompasses 10 courses. Required coursework explores topics including the physics of nanoelectronics, antenna theory and design, and digital signal processing. Students must complete a special project of their own design to conclude the degree. Distance students may present their special project in person or online, such as through a video submission. Applicants must hold a bachelor's degree in engineering or a related field from an accredited institution, with a minimum 3.2 GPA. Additionally, students applying to the MSECE online must submit GRE scores, a resume, and a personal statement. The program offers multiple start dates throughout the year in the fall, spring, and summer semesters. The university recommends graduate students pursuing a full-time courseload enroll in nine credits per semester, with a cap on any credits over 15. Students complete MSECE courses through the Canvas learning management system. The university charges variable tuition rates for the online engineering master's program based on whether a student resides in or outside of the state of Utah. Since first opening its doors to a class of 39 students in 1874, Purdue has established itself as one of the nation's leading land-grant universities. In addition to its main campus in West Lafayette, Indiana, Purdue hosts locations in Fort Wayne, Indianapolis, and northwest Indiana. The university also features a nine-branch polytechnic institute spanning the state and global and online entities. Purdue's main campus ranks fifth in the country for its online graduate engineering programs, according to U.S. News & World Report. The university offers five online engineering master's degrees through Purdue Online: an MS in electrical computer engineering, an MS in engineering (interdisciplinary), an MS in engineering technology, an MS in industrial engineering, and an MS in mechanical engineering. The 30-credit interdisciplinary online master of science in engineering offers students 12 concentrations. While admissions requirements vary by program, applicants should hold a bachelor's degree from an ABET-accredited institution in the student's engineering focus area or a related major. Additionally, students must submit three letters of recommendation, a resume, and a statement of purpose. The program considers admission of nonengineering-degree holders on a case-by-case basis. Purdue delivers courses online through Blackboard. New students can participate in a virtual open house and, once enrolled, take advantage of learning resources including tech support, academic advising, and a dedicated financial aid staff. Distance learners can access virtual counseling services through online, weekly one-on-one meetings with their instructors. With three campuses around Washington, D.C. and academic centers in Virginia and online, GWU serves more than 26,000 students on 500,000 square feet of educational facilities. The university's historic Foggy Bottom campus sits just blocks away from the White House. GWU offers hundreds of academic programs across 10 schools, including more than 100 online degrees and certificates. GWU offers four online engineering master's programs: MS degrees in electrical engineering, engineering management, and systems engineering, and a master of engineering in cybersecurity policy and compliance. Some programs, such as the electrical engineering MS degree, offer further optional concentration areas within the major. The majority of concentrations, including engineering management, emphasize STEM coursework. Students may apply to an online engineering master's degree during one of two fall start dates, two spring start dates, or an accelerated summer option. Spring and summer terms last for 10 weeks, while the summer semester lasts for five weeks. Distance learners may take one course per term. While admissions requirements vary, applicants should hold a bachelor's degree in their field of specialty from a regionally accredited institution, with a minimum 3.0 GPA, and meet prerequisites in undergraduate engineering, math, and physics coursework. One of the best-known departments of its kind in the U.S., GWU's School of Engineering and Applied Science boasts award-winning online graduate programs and expertise in distance learning. Distance learners complete courses synchronously online through WebEx and Blackboard, with support resources including career services, a writing center, library access, and tech support. Located along the Maryland/Washington border in College Park, UMD sits just nine miles from the nation's capital and in close proximity to Annapolis and Baltimore. The university offers hundreds of graduate programs, including an online engineering master's. UMD serves a student population of more than 10,000, with its largest enrollment in the A. James Clark School of Engineering. Students choose from a variety of online engineering master's programs at UMD, including concentrations in bioengineering, cybersecurity, fire protection, project management, reliability, and sustainable energy. Each of the engineering emphasis areas require completion of 30 credits in a combination of core and technical elective courses. Students must also meet prerequisites in their respective area of focus to earn the degree. Generally, the online master of engineering degree does not require a thesis component. Students may apply to the online engineering master's degree in the fall, winter, spring, or summer semester. Applicants must hold a bachelor's degree in their respective desired area of engineering expertise and submit a statement of purpose and three letters of recommendation. Some programs may require additional prerequisites specific to a particular field of study or submission of GRE scores. Students complete courses online through the Canvas learning management system. UMD offers a variety of resources for online learners, including test-proctoring services, tech support, library access, and several payment plans and scholarship opportunities through financial aid. Online students may attend commencement exercises at UMD in winter and spring terms. Earning an online master's in engineering can help professionals advance in any of the industry's subfields. Most programs include core courses in project management and team leadership along with specific concentration requirements. Details vary from school to school, but the list below provides a sample of real courses in the degree. This concentration, focused on providing accurate and up-to-date technological knowledge in chemical investigation, prepares students to work with applied chemical processes in a variety of industries. Students learn about biotechnological engineering, chemical process engineering, and biopolymers. Coursework includes chemical engineering kinetics, transport phenomena, and mathematical methods in chemical engineering. The civil engineering concentration equips students with the expertise to tackle the problems of roads, water systems, airports, bridges, and other structures. Learners focus on areas like public works, coastal ecosystem development, hydrogeology, and earthquake engineering. Courses include traffic operations, sustainability and green engineering, and computational methods in civil engineering. Students enrolled in an electrical engineering concentration observe topics from the fields of power, telecommunications, manufacturing, and renewable energy. Specifically, this discipline emphasizes grids, transmission systems, circuits, and microchips. Courses include optics and photonics, digital signal processing, and pattern recognition and intelligent systems; and the degree offers many sub-concentrations. Mechanical engineers design, develop, create, and test anything to do with moving parts. That might be an automobile, an elevator, an air conditioner, or a gas turbine. Students in this concentration explore advanced topics in manufacturing, robotics, thermofluids, and dynamics. Courses include applied fluid dynamics, mechanical vibration, and computational fluid dynamics. Rather than focus on making objects, industrial and manufacturing engineers concentrate on improving the processes associated with production. The systems engineering master's online concentration focuses on topics such as logistics, finances, and supply chain as they affect production processes. Coursework includes business fundamentals for supply chain management, system design and integration, and occupational biomechanics. Model-Based Systems Engineering: A fundamental course for future engineers in all subsets of the field, model-based systems engineering applies the principles of design and development to engineered systems. Students discover how to use modeling tools and ways to pair those tools with systems analysis. They also become familiar with various modeling languages. Principles of Project Leadership: Drawing from the discipline of technical management, principles of project leadership equips new engineers in all branches of the industry with the skills to oversee a project from conception to conclusion. Students learn project management methodologies, how to conceptualize and initiate a project, and techniques for communicating with a project team. Bioengineering Seminar: Bioengineers design, develop, create, and test artificial organs and tissues. These professionals apply engineering principles to biological systems and medical technology. This course introduces future bioengineers to the scientific fundamentals that underpin the discipline. Students explore the basic commonalities at the intersection of biomedical technology and engineering. Airport Engineering: In this course, prospective aeronautical engineers receive exposure to airport planning and development, as well as aviation systems and their functions. They master such topics as aircraft performance characteristics, runway lengths, navigation aids, airport configuration, noise, capacity, and delays. Construction Planning: Students with a future career in civil engineering often enroll in this course focused on estimates, bidding, project planning, and control in construction. Topics include techniques for project control, risk management, timeline management, and scheduling procedures such as the critical path method, the precedence diagram method, the program evaluation and review technique, and the line of balance. How Long Does It Take to Get an Online Master's in Engineering? The average online engineering degree requires students to earn 30-36 credits and takes full-time learners about two years to complete. Programs that require some on-campus attendance may take longer than those offered entirely online. Plus, a cohort learning arrangement can save time for most students by creating a course calendar by grouping learners to advance in lockstep. This arrangement may not save a transfer student time, however, and could lengthen the overall number of semesters to earn a degree. Asynchronous course delivery in which students study at their own pace may accelerate a learner's time in the program, and schools that offer seven- or eight-week terms often boast shorter times to graduation than those on a traditional calendar. Ultimately, the number of credits required and how many credits a student takes each semester will determine their graduation timeline. Attending an accredited school grants students access to financial aid packages, certification options, and degree utility not available through an unaccredited school. American higher education provides three types of accreditation: regional, national, and programmatic. Long considered the gold standard of accreditation, regional accreditation covers an entire institution. Six regional accrediting bodies confer their recognition on colleges and universities only within their regions. Regional accreditation is the most important designation for students to confirm when considering a school. National accreditation agencies usually accredit technical, career, or trade schools. These agencies include the Distance Education and Training Council and the Transnational Association of Christian Colleges and Schools. Programmatic accreditors confer recognition only on specific departments or programs within a university. Engineering's primary program accreditor is the Accreditation Board for Engineering and Technology (ABET). Ideally, an engineering school will hold both regional and ABET accreditation. In the United States, schools undergo the voluntary process of accreditation to demonstrate their credibility as higher education institutions. The federal government does not accredit schools directly, but it does approve private accrediting agencies through the U.S. Department of Education (ED). Agencies holding ED approval possess a legitimacy in the field of education that other accrediting agencies lack. The Council for Higher Education Accreditation (CHEA), a private organization, also recognizes about 60 accrediting organizations. Most legitimate accrediting bodies hold membership in both of these agencies. Prospective students can visit the ED and CHEA websites for a list of all accredited schools. The BLS projects that engineering and architecture occupations will grow by 7% between 2016 and 2026, in keeping with the national average. Engineers and architects bring in a median of $79,180 a year, a rate more than double what the average American worker earns. Across the country, engineering jobs offer lucrative salaries, and states with large populations and high numbers of engineering firms often boast high employment rates and wages above the mean. Plus, certain types of engineers, such as those in the aeronautical field, can expect to outearn their counterparts who are working in less profitable fields. Engineering refers to a broad field of study that includes four major branches: mechanical, chemical, civil, and electrical. Each branch contains several sub-branches, but in all forms of engineering, professionals apply science, mathematics, and empirical evidence in creative ways to design, develop, construct, and operate machines, structures, and other objects that improve human life. People who possess strong mechanical and mathematical skills with a desire to apply their problem-solving creativity will make excellent engineers. Aerospace Engineers: One of the highest paid specialists in the field of engineering, an aerospace engineer researches, designs, and develops products such as spacecraft, aircraft, missiles, and satellites. These professionals also create and test prototypes of their designs. Aeronautical engineers typically work with aircraft that fly within Earth's atmosphere, while astronautical engineers explore the technology and science of spacecraft flying outside of Earth's atmosphere. Civil Engineers: Civil engineers focus on infrastructure projects that develop both the public and private sectors by helping to design, build, operate, and maintain projects such as buildings, roads, tunnels, bridges, dams, and water supply treatment systems. Engineers with graduate degrees can lead public or private sector teams. Electrical and Electronics Engineers: These engineers typically work in the telecommunications, federal government, and semiconductor manufacturing sectors. They design and develop electronic equipment, test their designs, and supervise manufacturing. Electrical engineers produce items such as electric motors, power generation equipment, radar and navigation systems, and the electrical systems of aircraft and automobiles. Mechanical Engineers: Typically working with a team of other engineers and engineering technicians, mechanical engineers research, develop, build, and test mechanical devices. These professionals analyze problems that mechanical devices such as power-producing machines and material-handling systems can solve. They use their tools to build new devices, modify existing ones, and test their proposed solutions. Graduate degrees equip mechanical engineers with higher-level skills, leading to more pay and greater responsibility. Making professional connections and learning about different approaches to engineering is crucial to your success. Professional organizations offer an ideal entry point for students who want to learn more about their chosen career path. You will find three of the country's most prominent organizations established for professional engineers below. These organizations host networking events, provide online training, maintain active job boards, and offer other services for career-ready college graduates that prove invaluable as you complete your degree requirements and prepare to enter the job market. National Society of Professional Engineers: Created in 1934, the NSPE is the only multidisciplinary professional organization dedicated to professional engineers. The website includes extensive information about licensing requirements and procedures for professional engineers, as well as links to continuing education (CE) opportunities and an online career center. Institute of Electrical and Electronics Engineers: With more than 420,000 members in 160 countries, the IEEE is one of the world's largest organizations for engineers. Members receive discounted insurance rates and invitations to join local chapters, among other benefits. American Society of Civil Engineers: The ASCE began in 1852, and today represents more than 150,000 civil engineers around the world. Members receive eligibility for up to five free webinars per year, as well as discounts on CE courses, organizational publications, and conference entrance fees. American Society of Mechanical Engineers: Originally founded in 1880 to address professional challenges related to steam boilers, the ASME today represents more than 150,000 mechanical engineers. The organization regularly sponsors engineering competitions and dozens of conferences around the world yearly. Despite the relative affordability of online engineering master's programs, most students still need financial assistance. Students should complete a Free Application for Federal Student Aid (FAFSA) form to learn more about loans, grants, and other opportunities offered through the U.S. government. Additionally, private grants and scholarships are widely available through nonprofit organizations, companies, and other sources. Check out our collection of resources below to learn more about financial aid options. Completing the FAFSA is a crucial first step for any student with financial needs. Our FAFSA guide features a step-by-step rundown on the process, as well as answers to several frequently asked questions. Online programs can provide an affordable and flexible option for women trying to balance the demands of work, family, and earning their degree. We have curated a list of valuable scholarships specifically for women. Students who pursue online degrees will be eligible for scholarships, grants, and other financial aid unavailable to their brick-and-mortar counterparts. Learn more about these financial opportunities for web-based learners. Enrolling in an online master's degree program always makes for a significant investment, but tuition costs do not need to break the bank. We have designed our list of the best online master's programs for students on a tight budget. Software engineering remains one of the most sought-after degree concentrations for today's engineering master's students. Learn more about this exciting, cutting-edge field with our comprehensive degree guide. Students pursuing degrees in fields such as management and business administration often specialize in project management (PM). Check out our PM degree guide for more information. STEM fields are highly popular among today's college students. Learn more about some of the most lucrative career paths in different STEM fields. In recent years, a growing number of female students have chosen to earn degrees in STEM fields. Our guide looks at different trends related to women who major and pursue careers in STEM.